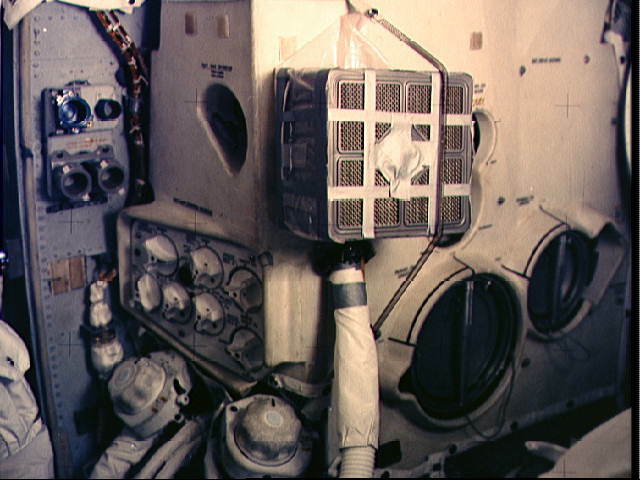 Interior view of the Apollo 13 Lunar Module (LM) showing the "mail box", a jerry-rigged arrangement which the Apollo 13 astronauts built to use the Command Module lithium hydroxide canisters to purge carbon dioxide from the Lunar Module. Lithium hydroxide is used to scrub CO2 from the spacecraft's atmosphere. Since there was a limited amount of lithium hydroxide in the LM, this arrangement was rigged up to utilize the canisters from the CM. The "mail box" was designed and tested on the ground at the Manned Spacecraft Center before it was suggested to the Apollo 13 crewmen. Because of the explosion of one of the oxygen tanks in the Service Module, the three crewmen had to use the LM as a "lifeboat".